I spotted this little meme on the web, and it threw me back to my high school days. No, I was not a teenage alcoholic. I was a “smart girl”. A geek. A goober. One of those four-eyed nerds who actually liked math. As you can imagine, socially, that was the kiss of death. Boys weren’t exactly knocking each other out of the way to ask the straight-A chick out. Unless it was to get her help with the Calc homework. Like most girls that age, I lacked the confidence and clarity to realize that that wasn’t necessarily a bad thing, and consequently, I habitually played down my brains. I would purposely act a little ditzy around the cute boys in order not to intimidate them. 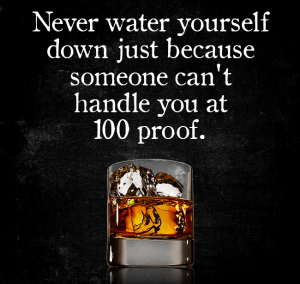 In other words, I watered myself down, because they couldn’t handle the 100 proof. Eventually, I realized that there are men out there who dig smart chicks, and more importantly, even if there weren’t, you can’t spend the rest of your life pretending to be something you’re not—especially something less than what you are. The bottom line? Be yourself. You are amazing just the way you are. If the people around you don’t like you at 100 proof, find new people. Well, apparently, I’m really old now, because some of my children’s friends are starting to get married. Okay, their much older friends anyway. The four of us (hubby, two kids, and I) attended one such friend’s wedding this past weekend. Man, weddings have changed a lot since the old days of hand-written directions to the church. Did you know it was a thing now for the bride and groom to entertain their guests with a professionally choreographed dance? I have to say, I was most impressed with the happy couple’s groovy moves. Back in our day, the hubs and I just held onto each other, swayed to the music, and tried not to step on each other’s toes. We also didn’t have our own wedding page on “TheKnot”. Frankly, I’m a bit jealous. It is indeed a cool use of technology. I particularly enjoyed TheKnot’s article on unique proposal ideas. 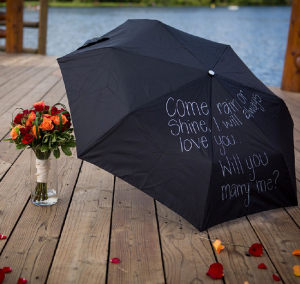 There are some really clever approaches out there, although I personally would stay away from any proposal that involves a crowd. No matter how sure you may be of the answer, it’s supposed to be a question, not an announcement. Spare yourself and your intended the embarrassment of a hemming and hawing response. That possibility aside, it’s a really fun list. Check it out for a quick dose of romance.